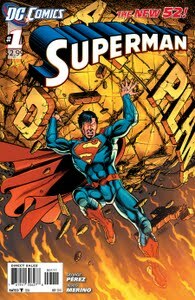 I didn't pick up Action Comics #1 because I didn't like the idea of going back to the beginning. I don't like the idea of killing off Ma and Pa Kent. And, the T-Shirt and jeans and baby cape look is not good either. I mean, if we want Supes to be more alien, why then do we make him look like a union steelworker with a mini-cape? I gave this issue a shot because of George Perez, one of the greatest artists of the last 30 years. He has drawn quite literally all the pantheons in Marvel and DC. However, his take on Superman leaves A LOT to be desired. OK, let's start with the costume change. What does a Man of Steel need with armor? I know, I know, he is honoring Kryptonian heritage. B.S.! Hollyweird and comics artists seem obsessed with armor nowadays. I look for Spidey to be wearing armor (again) very soon at this rate. And, why does Superman need a collar? The loss of the red undies on the outside makes the suit more bland. Less of a contrast. The red belt doesn't do enough to accent the look. Totally lame. Next, let's talk about the story. OK, again, this is sometime after Action #1, especially since it seems the background characters are referencing things that happened pre-Flashpoint in the equally pathetic "Grounded" Storyline (you know, the one where Mr. Truth, Justice, and the American Way was going to renounce his citizenship, until readers said WTF). However, this is "the new 52" so who knows! Lois Lane is not just a driven reporter seeking truth, she is a whore. Yep, she sleeps her way to the top. Great way to portray women! Oh, yeah....No Clark and Lois marriage. Let me guess, DC is going to go all Spidey and Mary Jane and make a great love affair turn out bad and instead just be "friends," ala the current garbage in Marvel's Spidey titles. Clark/Superman is a nostalgic milksop who seems to need some serious therapy. Then, we have the supporting characters. Funny, I thought the new 52 would be new, not recycled and recolored. I was wrong. Morgan Edge was a media mogul who took over ownership of the Daily Planet and owned Galaxy Broadcasting Co., a media empire. He was a white guy with brown hair who was eventually phased out in some of the other reboots that now evidently did not happen (like Crisis on Infinite Earths, for Heaven's Sake, which publisher Dan Didio said never happened, which means all the other crises after didn't happen either. Ugh, except for Flashpoint, barf). Well, now he is a bald black guy whom Clark hates and doesn't want to work for, going so far as to turn down the chance to be a TV anchor and columnist for the Planet. They try to make Edge into Rupert Murdoch, much as Marvel does with media moguls, with obvious characters of Bill O'Reilly and others. Very lame! I was so caught up in the travesties in this book it was hard to note the actual story and "villain." Yawn. If you are cancelling titles on your pull list, start with this one. George Perez is a genius, but even geniuses fail some time.